The old folks' fanzine is back, with one of the best issues yet. 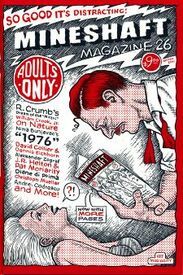 Starting off with the latest installment of R. Crumb's dream diary along with a pair of R. Crumb sketches, this issue features a great lineup of comics, including two by Copacetic fave, David Collier (one of which is written by auto-bio comics champ, Dennis Eichhorn), J.R. Helton and Pat Moriarity (who also contributed this issue's cover), Aleksandar Zograf, and a truly fine tale by Nina Bunjevac, along with some mighty nice illustrations by Christoph Mueller and William Crook, Jr. (who also offers his thoughts on the subject of his drawings), poetry by Diane DiPrima and more! Added bonus: an R. Crumb portrait of Wallace Wood adorns the back cover.